Iain Wardlaw claimed 3-13 as Hartshead Moor reached the Jack Hampshire Cup semi-final with victory over Buttershaw St Paul's last Sunday. HARTSHEAD MOOR’s hopes of a Bradford League double remain alive following a thrilling one-wicket win over Buttershaw St Paul’s in last Sunday’s Jack Hampshire Cup quarter-final. Buttershaw’s total of 143 looked to be below par but they fought back superbly after tea. Josh Fell hit 43 for Saints with Dharmesh Mistry (35no) supporting as Iain Wardlaw took 3-13 in eight overs, while Danny Squire, Mohammad Khan and Nat Skirrow picked up two wickets apiece. Khan followed up his efforts with the ball by top scoring with 55 but Hartshead lost wickets at regular intervals as Mistry helped get St Paul’s back into contention with 4-37. Rauf Qayyum (33) scored crucial runs when his side looked to be faltering but with nine wickets down, it was left to last man Chris Swift to get Moor over the line with two overs to spare as he hit the winning boundary. 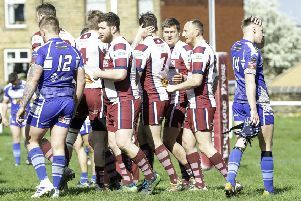 Hartshead’s reward is a home semi-final against their nearest league challengers Hunslet Nelson. Nelson continued their impressive form and having moved into second plaved in Championship Two on Saturday they reached the cup semi-finals with a 60-run win over Azaad. Joe Smith’s 81 helped Nelson to 223-7 and although Imran Mahboob made 51 in reply, Azaad were dismissed for 163 as Asim Iqbal took 4-18 in eight impressive overs. Altofts will entertain Wakefield St Michael’s in the other semi, with the final scheduled for Pudsey Congs on August 13. Altofts defeated Keighley by six wickets after the home side were bowled out for 117. Their top scorer was Adam Smith (42) as Kieran Holliday took 3-14 before Altofts were guided to their target by Farrukh Alam (56) and Kieran Miller (35). St Michael’s reached the last four when they defeated Gildersome by 45 runs. Alex Leyshon (64), Mark Atkinson (46), Ismail Patel (36) and Ayaz Sedat (36) helped St Michael’s to 243-8. Gildersome lost four early wickets in reply before Liam Knowles and Martin Morley both made 67 in a fifth-wicket stand of 130. Despite their efforts Gildersome finished on 198-8 as Hugh Birchall claimed 4-35 to see Saints safely through.